Surfriding, Canoes, and Swimming in West Africa, 1600-1940. Following publication of several articles in academic journals on surfboard riding in Oceania, Dr. Ben Finney (1962), examined accounts of surfboarding on the coast of West Africa. Initially noting Rouch (1949) and Beart (1955), he raised the question of whether surfboard riding developed as an "independent invention" in both locations, or by "invention in one and then diffusion to the other." 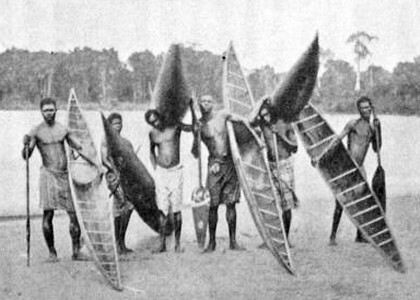 Finney considered and rejected the possibility of a recent diffusion from Hawaii, citing the early nineteenth century report by James Alexander (1835); and, noting the surfboard-like craft of Lake Bosumtwi identified by Rattray (1923), concluded that surfboarding in West Africa and Oceania was invented and evolved independently. The following review ranges beyond Ben Finney's focus on "the most distinctive form of surfing, surfboarding." It takes a wider perspective, suggesting that the origin and evolution of surfriding lies in the integrated relationship between the surfboards, swimming, fishing, and the sea-going craft of the ancient beachcombers of the tropics. Sincere thanks to Herve Manificat, who has done extensive research and made numerous contributions to the subject. Prof. Kevin Dawson: Swimming in Atlantic Africa, 7 Jun 2012.
organized by the International Swimming Hall of Fame (Ft. Lauderdale, Florida, USA, May 9-12, 2012). In one of the earliest European reports from West Africa, Johann von Lubelfing (1600) relates how, when absconding with stolen goods from his ship, two Africans were able to "swim below the water like a fish" to escape. Dutchman, Pieter de Marees (1602) describes the fishermen of Guinea as excellent swimmers, "easily outdoing people of our nation in swimming and diving." He observed that the young, "girls as well as boys," swim daily, and that some women were equal to men in swimming, but not in diving. On the day after the Ambtsforth fired upon a fleet of sixty African canoes, in response to a preceived attack, Andreas Joshua Ulsheimer (1604) reports that the ship was cautiously approached by two canoes. One natve was "repeatedly dipping a finger in the water and holding this wet finger over their right eye," the sign used along the West Coast to ask "do you come in peace and to trade?" On ecountering strangers at sea, the immediate assumption by indigenous sailors was that the newcomer's motives were either trade.or conquest. This scene, sometimes also preceded by initial confict, was continually re-enacted as the Europeans expanded their exploration of the world's oceans; in Polynesia the equivalent sign was holding up a branch of green leaves. On the Quaqua coast, Samuel: Brun (1620) notes that the local inhabitants use "a little raft of three or four pieces of wood, ' on which "they travel from the land out to sea, where there are such big waves that it is remarkable how these people can come through them." Michael: Hemmersam (1645) recounts an occasion when, after the canoes of two visiting Moors drifted away, the skipper threw them "a board (on which) they laid and swam ashore with it." He recalls "We were all quite amazed at this great feat of daring." In a chapter on child rearing, Hemmersam records that the mothers "tie the children (when 2-3 years of age) to boards and throw them into the water, and so they learn to swim." Apparently considering this parental instruction effective, he concludes "Thus they are brought up with little trouble." Jean Barbot possibly describes a similar practise, perhaps confirming Hemmersam, in his later account of West Africa, 1678-1712. At Cape Corso, Wilhelm Johann Muller (1669) notes that the children are taught to swim an early age and observes "an enormous crowd' in their daily ritual of bathing in the harbour, accompanied with considerable youthful mischief." The report from the coast of West Africa by Jean: Barbot (1712) predates the first European accounts of Polynesian surfriding by fifty years. Reminiscent of Hemmersam (1645), he also notes " the swimmers also use "small bundles of rushes, fasten'd under their stomachs." The surf skills of the canoemen of the Gold Coast were praised by Henry Meredith (1812); when returning to the beach they position "the canoe on the summit of the sea," and keeping. "as straight a course as possible ... conduct (it) on shore with surprising velocity." For the European passengers, this standard method of landing was a considerable thrill, mixed with a certain apprehension, and was later recorded by, among others, Paul B Du Chaillu (1867), Hugh Dyer (1876), John Whitford (1877), and illustrated in London's The Graphic (1891) and several French publications, the most dramatic of which is shown below. Senegal - Nigeria, circa 1850. Image contributed by Herve Manificat, July 2013, publishing details to be confirmed. In the most detailed account of African surfriding, John Adams (1823) writes of Fantee children amusing themselves in the ocean using terminology reminiscent of many reports from Polynesia. On "pieces of broken canoes, which they launch, and paddle outside of the surf, when, watching a proper opportunity, they place their frail barks (boards) on the tops of high waves, which, in their progress to the shore, carry them along with great velocity." That the surfboards are described as "pieces of broken canoes," is significant. In his seminal account of surfriding in Tahiti, Joseph Banks (1769) describes the craft, perhaps a little inaccurately, as "the stern of an old canoe." Broken canoes, most likely splitting longitudinally with the grain and with the timber already finished, would have been readily recycled, and one possible option was as a surfboard. In the Ellice Islands, Kennedy (1930) notes that the puke (the shaped bow covering of the canoe) is often used as a surfboard, and Bligh (1788) reported the Tahitians, on one occasion, were surfriding on the blades of their canoe paddles. (This last case was probably an aberration given the extreme surf conditions at the time- during this week every surfboard in Matavai Bay would have been in high demand). 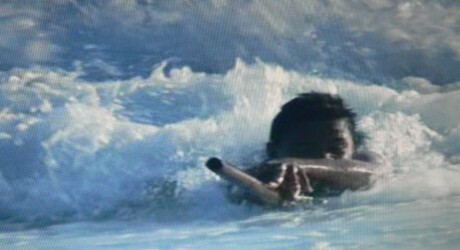 In an episode of the BBC documentary, South Pacific (2009), Bob Green observed juveniles surfing prone with canoe paddles on Anuta, in the Solomon Islands. Released as Wild Pacific in the USA, the title music is a ukulele medley of Over the Rainbow performed by Israel Kamakawiwo'ole. and the series was promoted with slow motion footage of big wave surfer Dylan Longbottom. 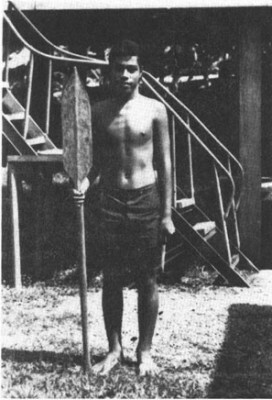 In 2018, Bob generously forwarded a number of screen shots (approximately at 48:16) and a1988 photograph illustrating a Solomon Islands paddle. Adams identifies the essential skill in a successful ride following the take-off; that is, maintaining the board's position in curl of the wave. In his own words, "the principal art of these young canoe men consists in preserving their seats while thus hurried along, and which they can only do by steering the planks with such precision, as to prevent them broaching to ; for when that occurs, they are washed off, and have to swim to regain them." Again, similar to Polynesian accounts, the children, "not more than six or seven years of age," swim expertly, and surfriding is community event, the best rides receiving " the plaudits of the spectators, who are assembled on the beach to witness their dexterity." After arriving by native canoe through "two or three lines of heavy rollers" at Accra in modern day Ghana, James Alexander (1835), like Adams, also observed juvenile surfboard riding. In a brief account he wrote of "boys swimming into the sea, with light boards under their stomachs. They waited for a surf (wave); and then came rolling in like a cloud on the top of it." In a later conversation, he was told that the local surfriders were occasionally threatened by sharks. 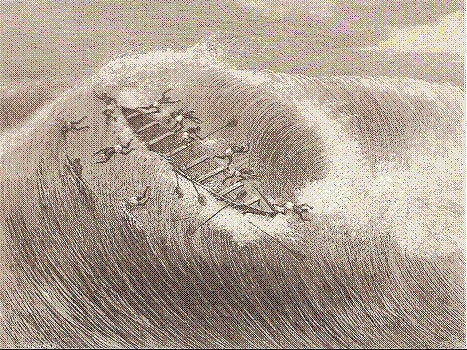 At Batanga (Cameroon), Thomas J. Hutchinson (1861) observed the local fisherman surfriding in their canoes where the waves broke on an extensive reef. Apparently, the conditions on this day were unfavourable for serious fishing, or particularly suited to canoe surfriding, or a combination of both. He writes of a group of the four or six riders in small light-weight one-man canoes. Hutchinson describes the paddle-out, take-off, steering with a trailing paddle at speed, and the inconvenience of the wipe-out, somewhat mitigated by their being "capital swimmers – indeed, like the majority of the coastal negroes, they may be reckoned amphibious.". Sharks are an occasional hazard; Hutchinson was told that, shortly before he arrived, a fisherman died after losing a leg to "a prowling shark."" While there are numerous accounts of (adult) West Africans riding waves in canoes, in those instances they are invariably in pursuit of their livelihood, either in transporting freight or passengers, or in returning from fishing. In this case, the Batanga canoe riders are clearly riding the waves for simple pleasure, and in this sense, as noted by Kevin Dawson(2009), it is "the only (account from West Africa) that describes adults surfing (recreationally)." In the second of two books of her travels to West Africa, a photograph by Mary H. Kingsley (1899) shows six Batanga men and their canoes, possibly identical to those observed surfriding by Hutchinson forty years earlier..
Mary H. Kingsley: Batanga Canoes, West Africa, c1899. When visiting the coast of the Batanga people, C. S. Smith (1895) observed and detailed their very light cork wood single canoes; going so far as to weigh one, at an impressive twenty-seven pounds. Too narrow to seat an ordinarily sized person, a narrow "saddle" laid across the gunwales was used as a seat, and with very light paddles, they "scud over the roughest sea without danger and with almost incredible velocity." Thus, "when they would rest their arms, one leg is thrown out on either side of the canoe, and it is propelled almost as fast with their feet as with the paddle.". 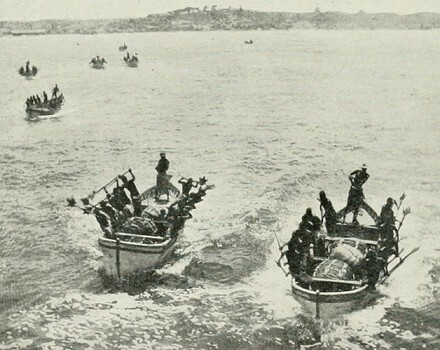 While employed to lay undersea cables On a Surf-bound Coast (the title of his book), Archer P. Crouch (1887) had many experiences in landing and launching in surf-boats and canoes. In his ethnographic study of the Tshi-speaking peoples of the Gold Coast, Alfred Burdon Ellis (1887) wrote that "every portion of the shore where the surf breaks unusually heavily, or rocks cause the water to become broken, and ... dangerous for canoes, has its local spirit." Surf-Boats comming of from Cape Coast Castle, (Gold Coast), 1910. Africa ... the British Empire in Africa, 1910, page 288. 1600 von Lubelfing : Swimming and Canoes, West Africa. 1602 de Marees : Swimming, Canoes and Fishing, Guinea. 1604 Ulsheimer : Canoes and Whaling, West Africa. 1620 Samuel Brun : Canoes, Rafts, and Fishing, West Africa. 1645 Hemmersam : Float Boards and Canoes, West Africa. 1669 Muller : Swimming, Canoes and Fishing, West Africa. 1712 Jean Barbot : Canoes and Fishing, Guinea. 1735 John Atkins : Canoes and Fishing, Guinea and Brazil. 1812 Henry Meredith : Canoe Surfing on Gold Coast, Africa. 1823 John Adams : Surfboard Riding on the West Coast, Africa. 1861 Thomas J. Hutchinson : Canoe Surfing in Gabon, Africa. 1874 W.H.G. Kingston: Great African Travellers. 1877 John Whitford : Surf Canoes and Boats, West Africa. 1881 David Greig Rutherford : Batanga Canoes, West Africa. 1887 Archer Crouch : Body Surfing, West Africa. 1887 Alfred Burton Ellis : Surf Dieties of West Africa. 1899 Mary H. Kingsley : Canoes and Fishing, West Africa. 1921 Lord Hamilton : Surfriding at Muizenberg, South Africa. 1922 Agatha Christie : Torquay, Muizenberg, and Waikiki. 1923 Robert Rattray : Padua at Lake Bosumtwi, Africa. 1932 George Bernard Shaw : First Surfboard, Muizenberg, SA. 1955 C.Beart : Jeux et Jouets de l'Ouest Africain. Memoires de l'Institut Francais d' Afrique, Noire No. 42, Dakar, pages 330-331. 1962 Ben Finney : Surfboarding in West Africa. 2009 Kevin Dawson : Swimming, Surfing, and Underwater Diving in Early Modern Africa and the African Diaspora. Geoff Cater (2000-2018) : History : Surfing in West Africa, 1600-1940.